A few years ago, a few friends and I teamed up to encourage each other to try to update a project or do a project all inspired by a specific store. For this project, I was inspired by Urban Outfitters. 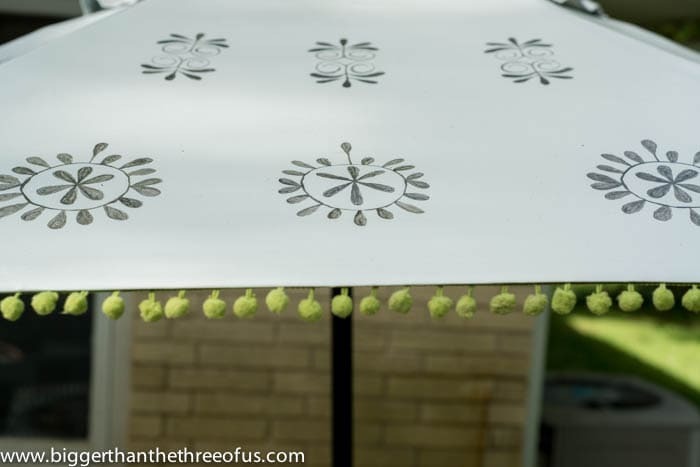 They used to have a gorgeous stenciled patio umbrella and I loved it. They no longer have it, but it was white with a stencil design and gorgeous trim hanging off the ends. It was so fun! I had a working umbrella, but it was really faded. 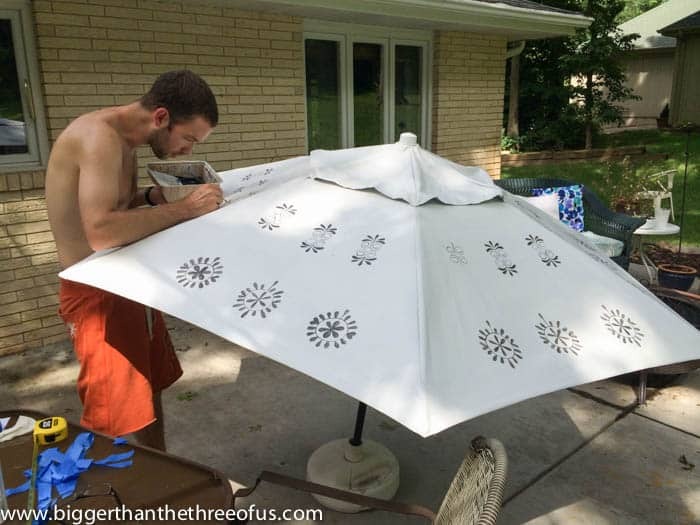 I didn’t want to spend the $300 on the Urban Outfitter umbrella so I decided to do a little patio umbrella makeover! Ready for the how-to? I started with an old patio umbrella. It actually wasn’t too old, but it was just really faded. Wash the umbrella down with soap and water. If you have a power sprayer, you might use that on the lowest setting. If not, you can get use this tutorial for cleaning without a power sprayer. 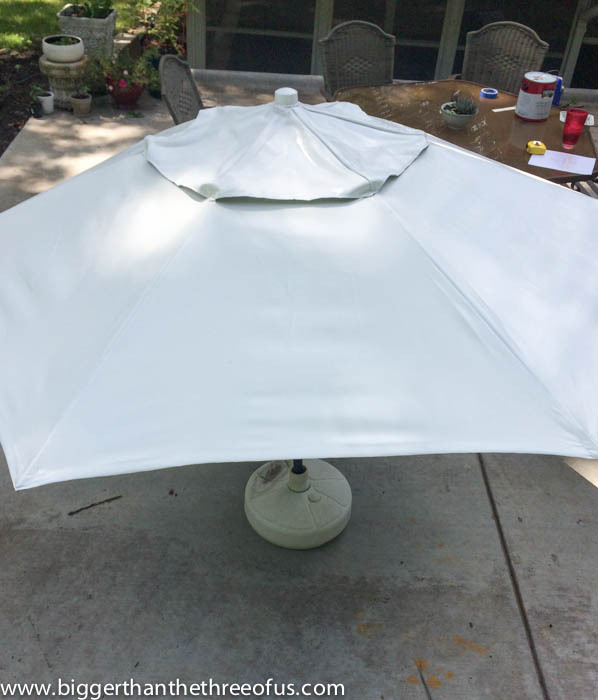 Using a paint sprayer, spray the umbrella with a light coat. Alternately, you could just use spray paint. Keep painting, following the directions of whatever method you are using until you have full coverage. 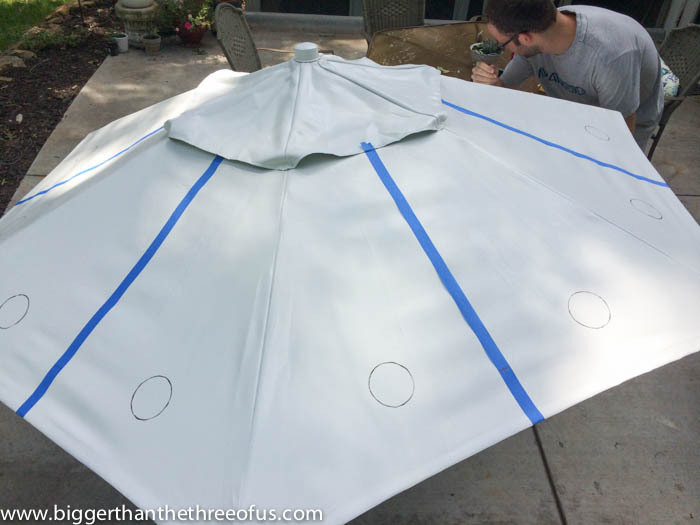 Allow for dry time before exposing the painted umbrella to outside elements. 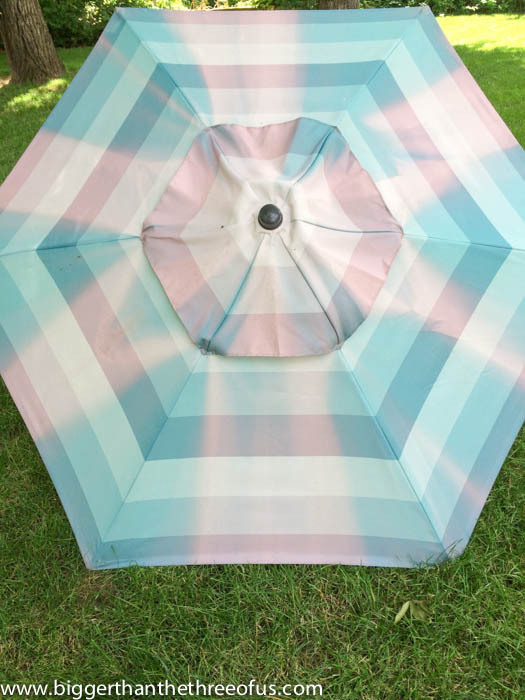 What Kind Of Paint Do You Use On An Umbrella? After using the roller on the first coat, I busted out my spray paint gun and used some white latex that I had leftover from our kitchen. It took about three coats with the paint gun to get a pretty evenly covered surface. 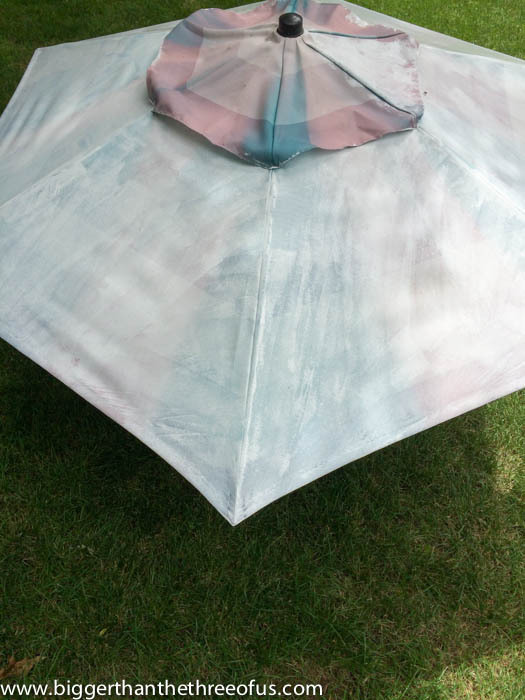 After I was successful with umbrella painting, I knew I wanted to make the umbrella even prettier. 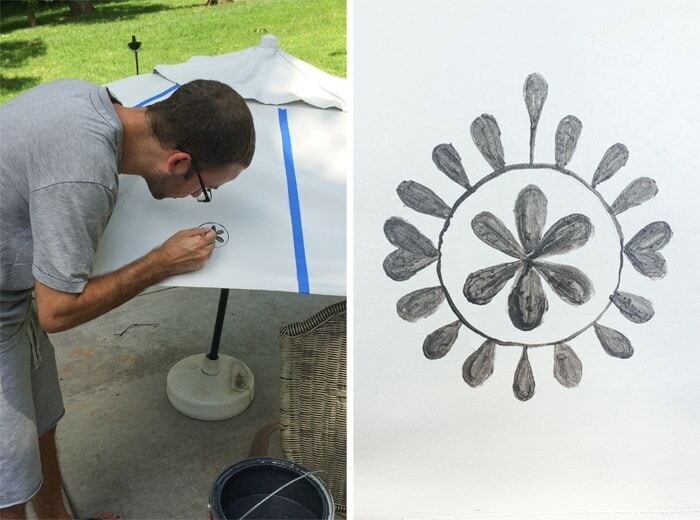 A stencil would have been a good idea to use for painting the umbrella but Luke handprinted a fun design instead (and we made a stencil to help with the hard parts). Find the middle of each section of your umbrella. Tape it off. Measure or just eyeball the circle spacing on each side of your tape. Use a circle form (we used a painter’s tape roll) to paint your circles. 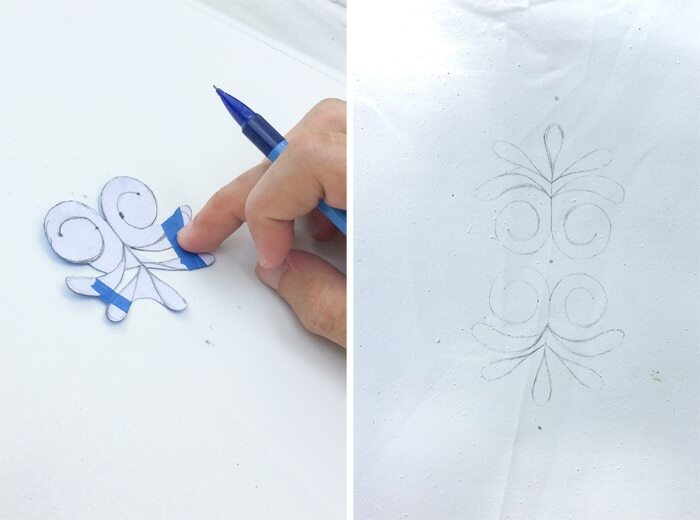 Create a stencil and hand-paint the design. Once we started hand-painting, we realized that it was going to take forever to finish. 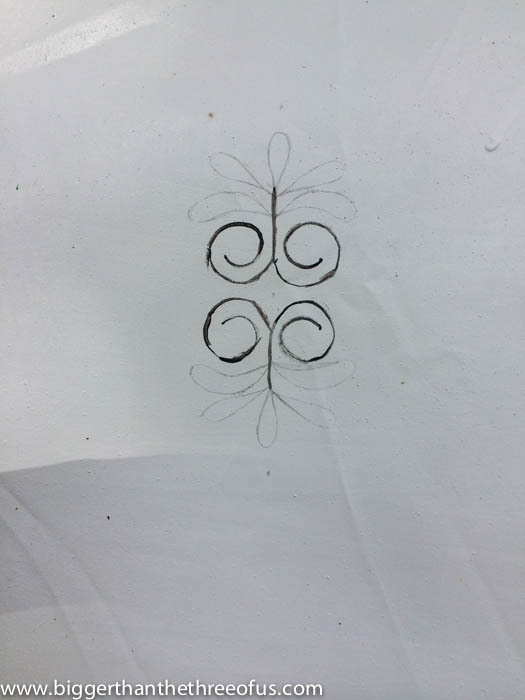 Luke had the idea to make a paper stencil for the next part. He copied most of the stencils on each of the sections and then we painted them at the end. I painted all of the straight lines (go me!) and he finished off all the petals. Of course, the straight lines were much easier to do. After we finished painting, I hot-glued the pom pom trim on and set it up. Instant gratification. For $20 (the cost of the pom-pom trim), this project was super cheap and highly effective in creating a much more cohesive, beautiful space. *I did this project back in 2014 and it held up for three years outside! I think that investment of making over the faded patio umbrella was worth the time for sure! Since then, we have changed the look of our outdoor patio space. 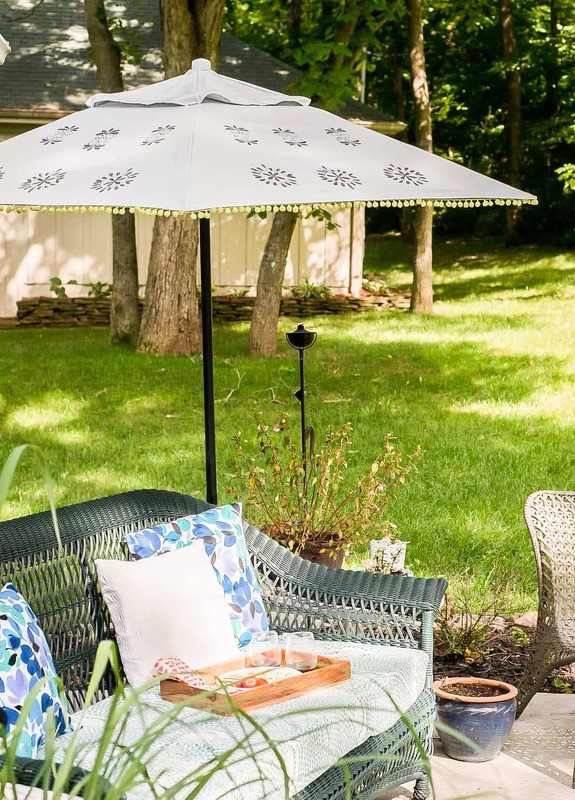 Tell me, do you miss this patio umbrella makeover on the new patio? Like I mentioned earlier, a few friends and I were inspired to create together. Check out what they created below. Ashley! I am SO IMPRESSED! I can’t believe the umbrella was painted with spray paint and kudos to you both for your patience in stenciling on the pattern. It looks so much like the UO umbrella for a fraction of the price. Love it! Thanks Tasha! The paint sprayer was definitely the way to go! I’m really hoping it holds up well, because it just adds so much to the patio! Wow, from seeing the finished image I never would have guessed what you started with! How nice of your husband to help out : ] Great styling in your photos! It was pretty sad looking! He’s generally pretty good about helping. Thanks for the compliment on the styling. I feel like I need some help with that overall. Yes! I’ve been waiting for this one! I love the way it turned out! The yellow pom poms are the best. Yay for sweet DIY umbrellas. Thanks Alexis! I felt kinda bad when I saw it on your IG because I knew they were going to be pretty similar! Love how you did yours as well (and that you didn’t make the mistake of trying to roll it!). lol. I love that you reused an old faded umbrella for this project! Who knew? It turned out so great. Thanks for linking up at The Makers. It is always great to have you. This is beautiful, Ashley!! I was wondering if those could be repainted. (Because I am sure the sun does a number on the color! Awesome job! Thanks Kristi! So far so good with the paint, but I do wonder how long it will last! Great job, Ashley and Luke! Out of curiosity, how does the fabric lay when the umbrella is collapsed? I’d like to try this, but need to be able to close it for storms, etc. Thanks Frank. The umbrella collapses just the same. It doesn’t lay quite as flat when it’s down, but it’s definitely not noticeable. So, about the time you get the project done, your weekend is over and it is time to go back to work. Yep, the life of a DIYer! Hi. What is that puffy leaved plant….way cool. Hmm, the bigger one? It’s lemon grass. We have it to hopefully repel mosquitos. 1. I never would have thought of using spray paint on fabric!-I wouldn’t think it would dry smooth. But it looks great! 2. Didyou make or buy the outdoor cushion for the wicker bench? I wouldn’t recommend using the sprayer on pillows, but for a thicker fabric like the umbrella it worked great. I recovered the bench cushion in just some leftover curtain panels that I had around the house. Thanks for stopping by! What a beautiful umbrella. So much more beautiful then the original. I just found your blog. And I really like it.It’s so lovely and creative. Thanks Evelyn. We love it. It’s holding up great! We have it out from May-Oct and then take it in through the winter. I did wonder if it would hold up but so far we have had no issues. Good luck with yours and if you try it… send me a pic!